I was visiting Inkurable Stampers the other day and found out that Sara is having a gothic arch challenge every 2 weeks for the next year. I said to myself, self, I want to do this. So last night I made this arch and just loved how it turned out. I used some glossy photo paper and stamped it with Versamark Ink with a Clearly Impressed butterfly stamp from the Fresh Flower Elements collection. I then applied some clear EP (embossing powder) over the stamped images then heat set them with my heat gun. Then using Distress inks I randomly covered the photo paper with Peeled Paint and Spiced Marmalde inks with an ink blending tool. I then cut out an arch template shape and mounted this arch on a chipboard base for sturdiness. I also inked up some bassill cardstock with the same distress inks and stamped in black dye ink a Technique Tuesday, Flea Market Finds, mini stamp. I then used a butterfly paper punch to cut out my butterflies from my inked paper and applied them to the edges of the arch. The lady image was placed so that a set of wings were behind her giving the image of her flying about. The toadstools were then applied and both the toadstools and butterflies have Diamond Stickles applied to them for that little bit of magic. 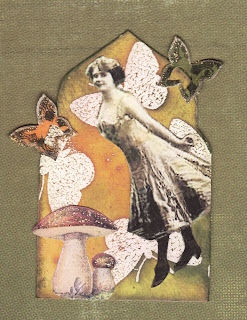 I have named this ATC......Dancing with the butterflies. It just popped into my head as I was gluing the lady on. Thank you for looking and please stop by again. Very pretty les, thanks for sharing how you made it.